Most of us are aware that Valentine's Day is coming up, whether we celebrate it or not. 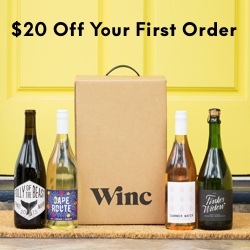 For us, it's an excuse to try a new restaurant in the area. On Valentine's Day two years ago we discovered a delicious beer, last year we discovered a delicious pizza, and this year we're hoping to try out a new restaurant that boasts southern + public house fare. I've been stalking their ever changing menu and I am hoping to indulge in some Chesapeake oysters, roasted bone marrow, and house red wine. We also celebrated a little early with a small event at our local Whole Foods. 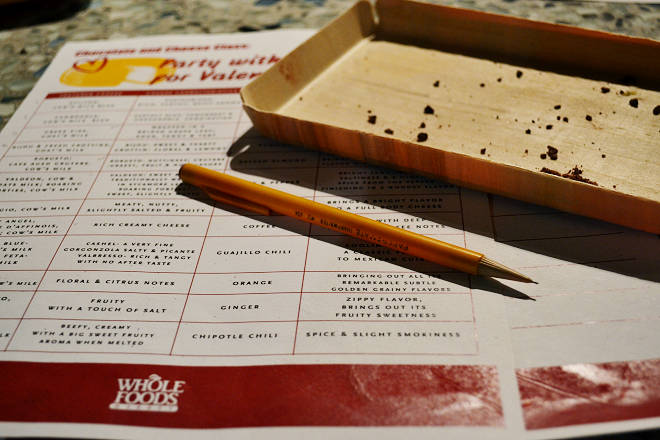 Outside on a cool + breezy night on their covered patio they set up a cheese and chocolate pairing class. 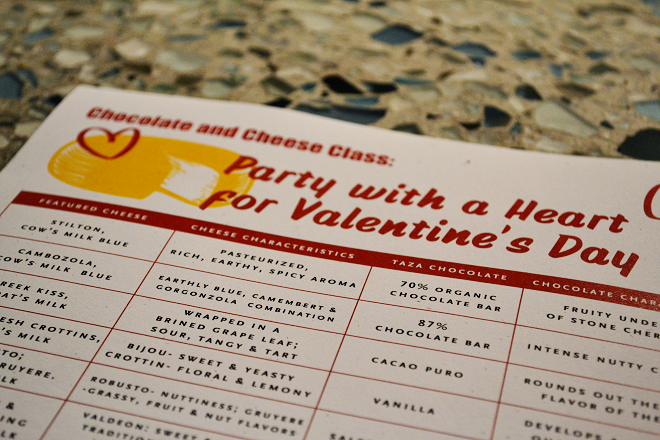 We love stopping by the cheese section at Whole Foods, tasting new ones to take home, and we especially love the Taza Mexican stone ground chocolates they've been displaying in the specialty department. They created 12 rich + savory pairings for attendees, ranging from soft + tangy goat cheese with vanilla flavored chocolate to rich + creamy French cheese with coffee flavored chocolate. 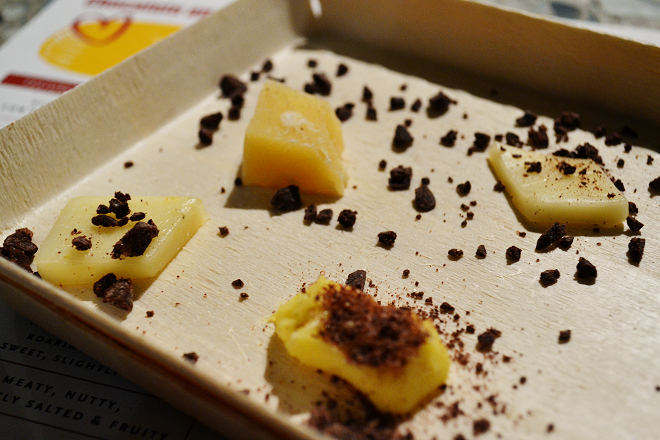 My favorite pairing was the parmesan cheese with orange flavored chocolate. I typically don't like orange and chocolate together, but put it with the floral and citrusy parmesan cheese, it was phenomenal! 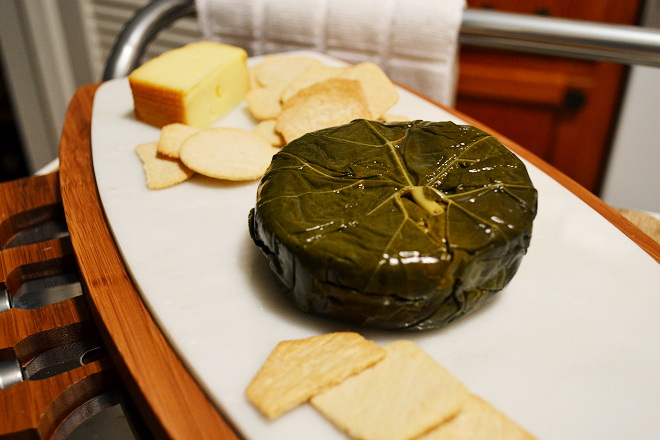 My new favorite cheese by itself was one called "Greek Kiss," in which it was soft goat cheese wrapped in a brined grape leaf, described as "sour, tangy, + tart." It was one that we had to go inside to the cheese department and bring home with us. The presentation was so pretty of this cheese, and it was definitely a pleasure to snack on. 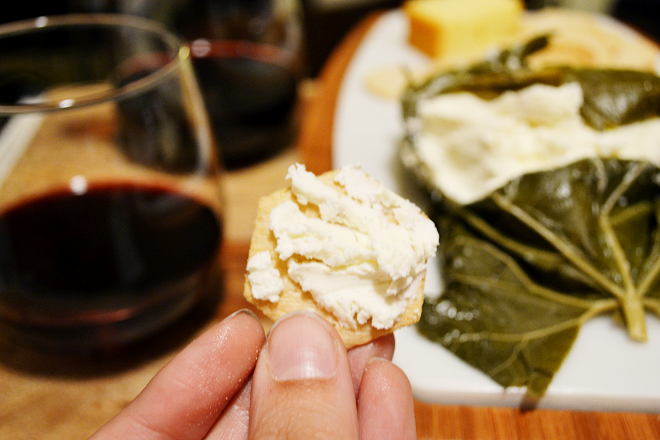 Goat cheeses are my favorite because of their unique tang, and I think the briny-ness of the marinated grape leaf added even more likable characteristics to it! Feeling culinary inspiration, we decided to make hummus + pita chips at home that evening. 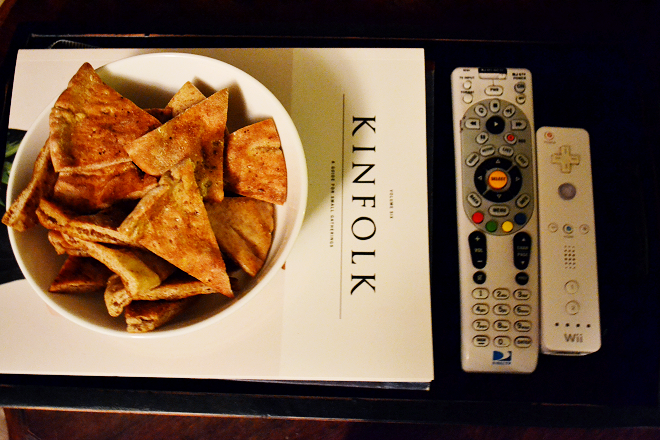 We grabbed our bowls full of pita + hummus and plopped down on the couch for a movie. 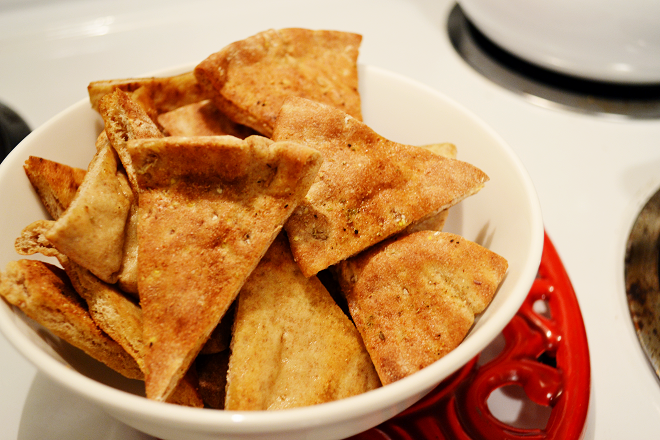 The pita chips were simple and easy to make. I chopped the pita bread into triangles for easy scooping, then I spread them out on a cookie sheet, drizzled them with olive oil, salt, pepper, and garlic powder and popped them in the oven until golden brown + crunchy. 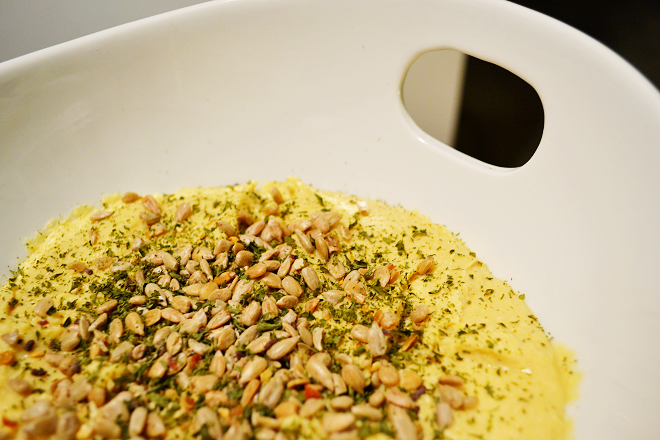 We used this recipe and our new, big, and beautiful food processor to make a big batch of hummus. 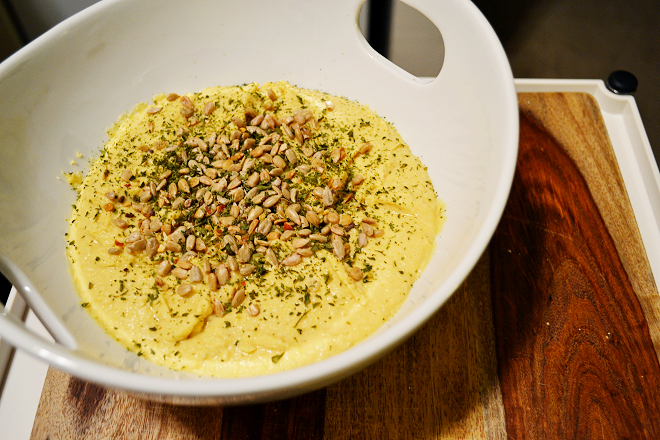 We added extra garlic to the recipe, and topped the hummus with toasted pine nuts + a sprinkle of parsley. Classes seem to be flying by; I've already completed one of our semester projects and started on a few of the others. As usual, the semester is moving fast, but I hope it goes slow enough for me to get good grades. I almost feel as if this last semester worth of grades don't really matter, but I definitely want to be able to say that I finalized wedding plans while still making Dean's List. This week we finished our invitations! 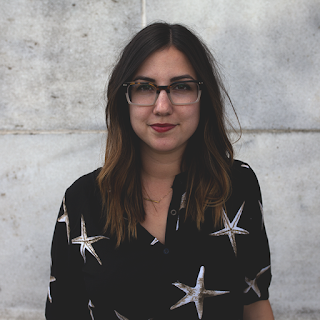 They were designed by one friend and letterpress printed by another. I'll be sure to give you guys a sneak peek once they're in the mail. One more thing crossed off our list of to-do's! The last two evenings I've been showing down on chipotle hummus, pita chips and a big bowl of veggies, yuuummm!! Wow, this sounds really interesting. 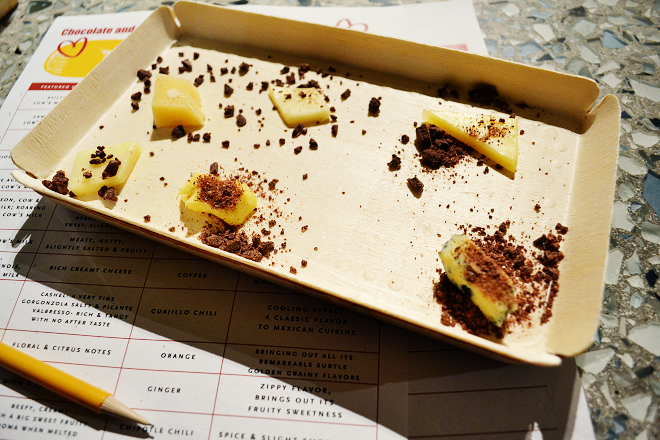 I've never tried a cheese and chocolate pairing before. I'd try it. That looks amazing. You're a great photographer. Thanks for stopping by my blog. getting so hungry reading this! phoar - this looks yum - in a very unique and unusual way...! Oh wow! All this looks so so good. Drooling here! And chocolate and cheese are two of my favorite things in this world. mmm some of my favorite things..
What great little snacks! Getting so hungry! This looks so delicious! 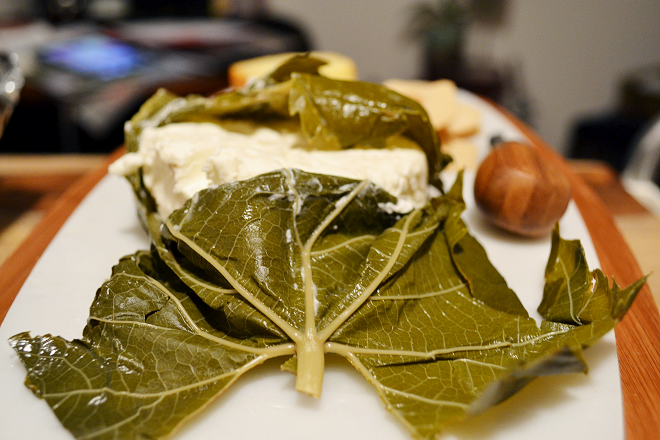 Dolmas are so gooooood and im sure that goat cheese was even better with those grape leaves. yum! Wooooaahhhhh. This is interesting in the coolest way possible. Okay, I'm super hungry. What an awesome post. I love cheese and chocolate and hummus. Yum! !